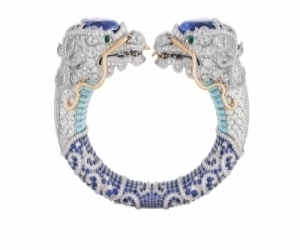 One of the most talented and distinctive Spanish jewelry designers Luz Camino and her son Fernando presented their new works at the annual exhibition of designer goods in the luxury goods store “Bergdorf Goodman” in New York. And before the “Pencil Shavings” collection (“Pencil Shavings”) set off on a journey across the Atlantic Ocean, they showed it to me with their son. The idea of ​​the Pencil Shavings collection is completely built around modest wood shavings resulting from sharpening pencils. Although many people associate the work of this designer with exquisite jewelry (in which cloisonne enameling was often used and images of flowers and other objects of nature were used), Luz says that she was also always fascinated by abstract forms. She believes that even household items are able to show their inherent beauty. So, creating a year ago one of her extraordinary collections “Rubber Band” (“Rubber Bands”), Luz was inspired by the images of pieces of rubber band, wriggling and taking the most unusual forms. This year, she was interested in the unexpected form of pencil shavings. “I tried many different types of pencils: traditional pencils and eye makeup. Almost all kinds of pencils went through my hands, trust me, ”Luz confesses to me, while she removes a gold ring in her pen-shaped chips from her finger, the edges of which are covered with black and yellow enamel, allow to recognize her“ belonging ”to pencil from the famous brand, the manufacturer of writing items “Staedtler Noris”. “I love the beauty of imperfection,” says Luz, and turning the gold ring in the light shows the delicate motley wood structure. Surprisingly, these rings are comfortable to wear, and since the edges of the gold shavings are covered with colored enamel, this allows you to determine the top and bottom of the ring, and accordingly place them on your finger at will. The gold ring, decorated with spinel and diamonds, looks exceptionally elegant and even quite traditional, since the pieces of chips are fixed on the usual cylindrical gold base. But I liked more the model with fancy sapphires inlaid on the edges, which, it seems to me, convey the amorphous form of wood chips well. Rings with black and gold enamel at the edges from the collection “Pencil Shavings” were exhibited in the “Bergdorf Goodman” shop with a limited edition of 20 and 100 pieces on November 30, 2014. 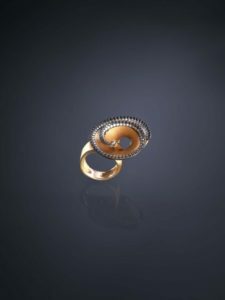 In addition to the objects from the Pencil Shavings collection, some of her unique works of art, previously made in a single collection collection, are participating in the Luz Camino jewelry exhibition. Including the sensational brooch “Artichoke” (“Artichoke”) with garnets, diamonds, tourmalines and enamel. And a fancy pair of “Peas in a Pod” earrings, made of ebony with peas made of turquoise, decorated with tsavorits, diamonds, silver and gold. Other unusual and unique decorations are the brooches from the Thinking Velazquez set. 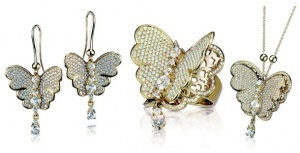 These are three ephemeral, translucent butterflies, made of quartz and platinum, and another, made with enamel, gold, silver, spinel, zirconia and diamonds, the result of inspiration from Diego Velasquez’s Meninas, worthy of being in one hair from the women represented there. “I guess I provided a lot of food to my brain this year because many of my jewelry is inspired by food,” says Luz, picking up a pair of gold earrings decorated with sapphires and shaped like fried potato slices. Luz Kamino will be in New York all the time it takes to present his exhibition and communicate with customers who may want to learn more about her wonderful world. In a romantic trip for wedding rings!